» Anyone here speak English? 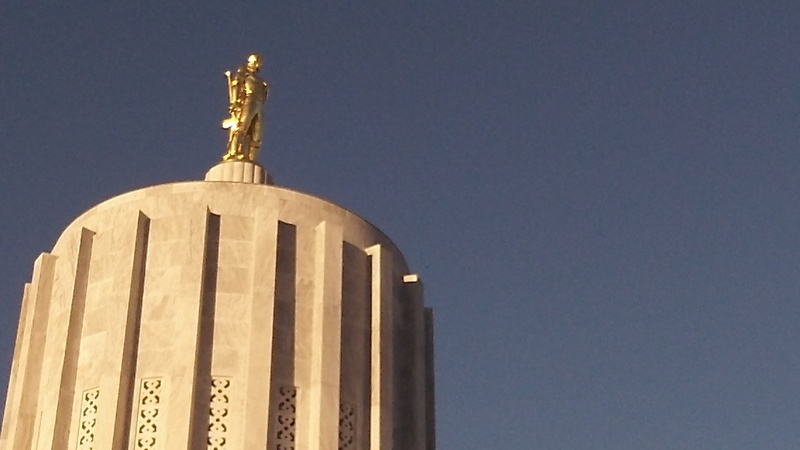 The Oregon Capitol, where foreign languages are not usually a problem. Sometimes, when there’s disagreement on Oregon ballot titles, English seems to be a foreign language. Consider a case now before the Oregon Supreme Court. Last spring, three Republican legislators (Reps. Mike Nearman of Independence and Sal Esquivel of Medford and Sen. Kim Thatcher of Keizer) filed a prospective initiative petition that would declare English to be the official language of Oregon. It would require that all state and local government actions be taken in English but would allow for exceptions, such as to comply with federal law, to teach English to people who don’t speak it, to promote trade and tourism, and so forth. The attorney general’s office drafted a ballot title that started, as required, with a “caption” of no more than 15 words. “Requires government actions/communications in English (with specified exceptions), limits laws allowing non-English documents/services.” Simple and true, though it doesn’t exactly sing. But opponents objected, claiming the title was deficient in many ways. And the attorney general’s office agreed to change it. The new version: “Changes state/”subdivision” (undefined) laws regarding English/other-language use and requirements; exceptions; authorizes lawsuits.” Huh? The idea, apparently, was to make the caption as confusing as possible so that voters who glanced only at those words on the ballot would shake their heads and vote no. The petitioners were not happy with the altered version, and they appealed to the Supreme Court. As of Oct. 12, the case was still pending, the state elections office told me. Simple. It’s the language called JIBBERISHLAWYERITICS. We actually pay these people to do this bad of a job?